LYNCHBURG, VA -- Masai Russell of the Bullis School (MD) nipped a strong girls 55 meter hurdle field to win the event at The VA Showcase on Saturday at Liberty University. Russell's winning time of 7.84 set a new US No. 1 mark for this season and broke the existing Maryland state record. Shadajah Ballard of Western Branch (VA) was second in 7.87, with Taylor Grimes of Bishop McNamara (MD) and Nansemond River's (VA) Kori Carter third and fourth at 7.89 and 7.90. The race was tight from the blocks, as the four runners in the middle lanes fought for an edge. In the end, it was Russell who out-leaned the other three hurdlers at the line, for the win. For the boys, Kyle Garland of Germantown Academy (PA) pulled away from the field in the final 20 meters to win in 7.38. Daiqwaun Fairchild of Nansemond River (VA) was second in 7.43, with Daniel Whitfield of Wise HS third in 7.54. 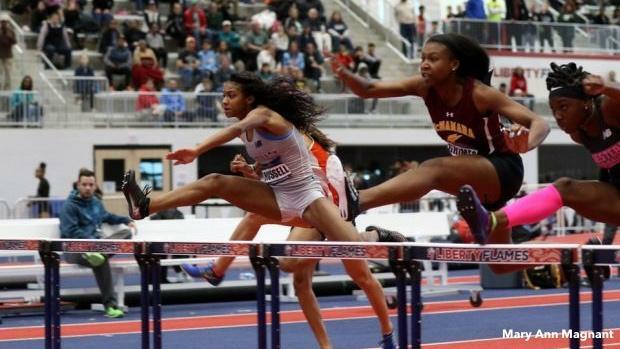 The South Hampton Roads (VA) contingent of hurdlers were using the Virginia Showcase to stake their claim as the nation's best, with Western Branch, Oscar Smith and Nansemond River hurdlers all in the mix for bragging rights. The festivities began on Friday with the 55-meter hurdle preliminaries. With the fastest heats running first, no less than five local hurdlers squared off in Heat 1 between the boys and girls events. For the girls, Western Branch junior Ballard, who held the Liberty facility record of 7.88, got the smoke rising from the Liberty rubber early with her top-seeded winning time of 7.95, good enough to maintain her spot at US #2. Nansemond River's Carter, placed fifth in 8.04, with both easily advancing to the finals. On the boys' side, Oscar Smith brought a pair of hurdlers -- Kurt Powdar and Aaron Shirley to Lynchburg with the hope of upending US #1 Garland of Germantown Academy (PA). In the opening heat, Powdar drew first blood, besting Garland, with his US #2 winning time of 7.28, while Shirley tied with Garland at 7.33, setting up a Saturday battle with the title, as well as pursuit of Garland's US best time of 7.25 in the balance.